This original Cuisinox Elite 11 piece Fondue Set, complete with porcelain insert and 3-ply cooking pot, is the perfect encore to any dinner. 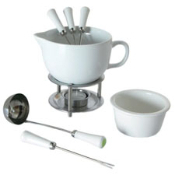 Enjoy this 3 in 1 fondue set for your cheese, chocolate or Chinese fondues. 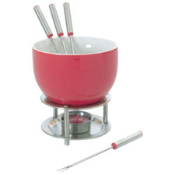 This colorful Orka Ceramic Chocolate Fondue Set has a red and white ceramic pot along with 4 multi colored forks. This Orka chocolate fondue set will keep the party rolling and the guests coming back for more. An attractive Ceramic Deluxe Sauce Boat set by Orka. This sauce boat is perfect for keeping sauces warm at the table. Serve gravy, melted butter, chocolate and more without a messy pour from the deluxe sauce boat.